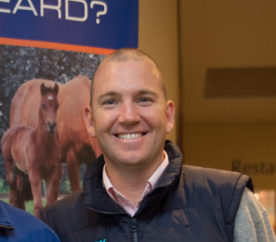 A graduate in Law and Agricultural Science, Andy has developed a strong career in the Thoroughbred Industry. A Victorian born and bred, Andy is passionate about racing and breeding in Victoria and has raced, bred, managed, advised, purchased and sold. Andy’s involvement in the industry was initially in bloodstock purchasing, management and syndication with Lindsay Park. He was then recruited by Darley, the biggest stud and racing operation in Australia with a very strong presence and significant investment in Victoria. He works out of Carbine Lodge at Flemington and Northwood Park at Seymour and his role as General Manager of Victoria oversees both racing and breeding with a focus on stallions and nominations. Andy is a member of the VRC, MVRC and MRC as well as the Thoroughbred Club of Australia.